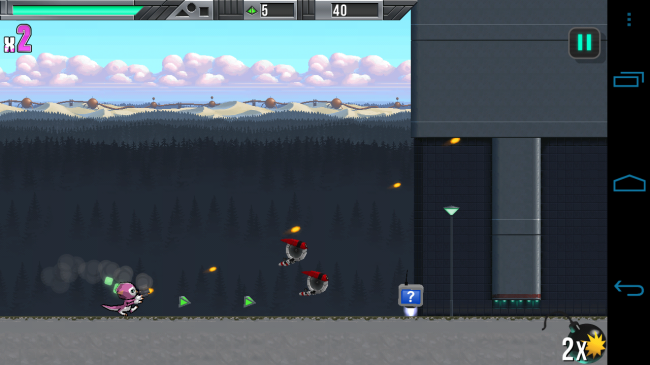 There’s a new platform shooter on Android called Project 83113. The game performs very well, but what makes it stand apart is the awesome soundtrack and excellent visuals. The game uses swipe controls, which is also a good change instead of on-screen buttons because it makes the overall look of the game much easier on the eyes and fingers. The game looks to take place in the future and revolves around our main character Belle. Her goal is to collect items, weapons, and destroy all the baddies by jumping, ducking, and tapping on enemies to blow them away with her bright, yet powerful Blast Attacks. At the end of each world there is a boss and as you can imagine, they get harder as the game progresses. I have a feeling this game is going to come in handy while I wait for my flight tomorrow to Google I/O. The game is free for now on Google Play, so hurry and grab it.